150. BATS! I learned a lot about bats for this page, because it seemed like fun. For example, the basic difference between microchiroptera (wee bitsy bats) and megachiroptera (big damn bats). Big bats tend to be fruit-eaters and have longer snouts; little bats are the pug-nosed ones who eat bugs, as in panel six. 151. WARNING: SPINOZA BABBLE BELOW! Ignore my rambling and skip down to the other notes for this chapter by clicking here. “Like Spinoza” – as I noted before, the philosopher Spinoza was a Jew (but only by upbringing and heritage), and an atheist (but only in popular conception) and regularly bullied for not becoming a Christian (since, after all, so many of other people already were, and since his knowledge of Christian scripture and theology was fairly formidable). Professor J. Thomas Cook of Rollins University has written a nice essay on what the hell this actually means and why Spinoza might have said it, which you can read here. Less comforting, however, is Spinoza’s correspondence with a former student, Albert Burgh. Burgh left Spinoza’s tutelage and ended up jumping with both feet into the Roman Catholic church. He promptly wrote back to his former teacher and insisted on his conversion, in language heavy on the fire and brimstone (the phrase “your pestilent heresy” comes into play). “I will not imitate those adversaries of Romanism, who would set forth the vices of priests and popes with a view to kindling your aversion. Such considerations are often put forward from evil and unworthy motives, and tend rather to irritate than to instruct. “I will even admit, that more men of learning and of blameless life are found in the Romish Church than in any other Christian body; for, as it contains more members, so will every type of character be more largely represented in it. You cannot possibly deny, unless you have lost your memory as well as your reason, that in every Church there are thoroughly honourable men, who worship God with justice and charity. “As it is by this, that we know “that we dwell in God and He in us” (1 Ep. John, iv. 13), it follows, that what distinguishes the [Catholic] Church from others must be something entirely superfluous, and therefore founded solely on superstition. Later on he goes off at Burgh’s apparent intellectual contradictions with a more visceral oomph. It’s really a wonderful (and entertaining) letter, written in a cool and even-handed tone. Various readers have taken it as an anti-Catholic tract, but it’s fundamentally an anti-hypocrisy tract; as various passages suggest, Spinoza could’ve written essentially the same letter to Burgh if he’d converted to Lutheranism or even Islam. What I enjoy in this is that Spinoza never displays any animus against religious faith that is based in love and/or reason. He instead consistently deplores the superstition, fear, circular reasoning, and political/economic influences that he sees at play in religious organizations of all stripes, and makes a determination that the good among the faithful are good because of some universal aspect of godliness, not because of the particulars of their affiliation. Read the whole letter (along with Elwes’s translations of most of Spinoza’s extant correspondence) over at the Library of Liberty. On the whole, you can see why Luther is fond of the guy. The principle of matrilineal descent says that a person with a Jewish mother can be considered Jewish as well, while a person with a Gentile mother – even if their father is Jewish – is a Gentile. This can seem odd in light of the predominantly patriarchal structure of the Judeo-Christian-Islamic tradition. This passage is taken up in the Talmud (“the Study”), a complex collection of ancient rabbinical debates about Judaic law (Mishnah) and tradition (Gemara). Since the issue is raised in the Torah, it’s debated in the Mishnah, in a section called the Kiddushin. 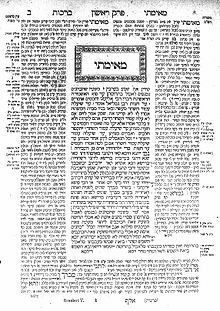 The Talmud is difficult to parse online, since it’s essentially a collection of ancient legal arguments written in the margins of books over centuries and its layout reflects that eclectic form of debate. It’s also difficult to parse in print, because it’s a collection of ancient legal arguments written in the margins of books over centuries. Luckily we have Dr. Susan Sorek of the University of Wales in Lampeter to explain it all for us, and you can read her article on the subject here. Compatibility with Roman laws surrounding inheritance and citizenship, ethnic purity, the growing importance of Jewish women due to their supposedly greater inclination to virtuous charity than Jewish men, the destruction of the Second Temple, the changing nature of Gentile conversion, mother figures in scripture…the only real consensus is that the matrilineal descent became widely accepted after 70 CE or so and hasn’t really been challenged since. Anyway you look at it, Luther is basically boned. Having a Jewish mother was unfortunate but not socially prohibitive in 18th century Gentile society; having a Jewish father, a lot tougher. And in Jewish society, as the matrilineal stuff above suggests, Luther wouldn’t be considered a Jew until he formally converted. Which would, yes, involve circumcision. Page 153-159. You’re on your own here, kids. See you in the next chapter.